1. Preheat oven to 425°F. 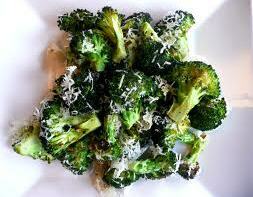 In a large bowl toss the broccoli florets and minced garlic with olive oil and lemon juice until lightly coated. Sprinkle salt over the broccoli and toss to coat. 2 Arrange the broccoli florets in a single layer on a greased baking sheet. Roast for 16-20 minutes, until cooked through and nicely browned. 3. Put the roasted broccoli back in the bowl and toss with black pepper and parmesan cheese.